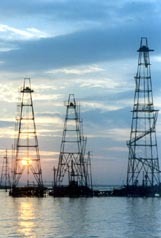 LUKOIL Overseas completed the environmental impact assessment of the second exploration well construction in the D-222 (Yalama) prospect in the Azeri sector of the Caspian Sea. The general contractor of the assessment project, LUKOIL-VolgogradNIPImorneft, performed the necessary work. In particular, this January a maritime expedition on the Alif Hadzhiyev research vessel carried out the baseline study of the contract area environment, then the environmental impacts were modeled both for the normal drilling mode (with a powerful state-of-the-art Heydar Aliyev rig), and for contingent emergency situations; the infrared satellite image of the drilling site was interpreted and calculations were performed to assess the potential risk and damage to environment. For the fulfillment of the set tasks, research organizations of Azerbaijan were engaged as subcontractors. The key issue of the assessment was the definition of the amount of damage to the fish stock. Taking into account the special features of the offshore drilling process and the water depth at the well location (about 700 meters), the damage will be minimal and limited only to the putting of feed organisms (plankton and benthos) out of fishery turnover. In order to mitigate the adverse impact on the environment, a rescue and salvage ship will be on a permanent duty in the drilling area. In addition, an environmental monitoring system will be implemented, oil spill contingency plans and emergency response plans will be developed, divers will regularly inspect the casing, and limitations will be introduced for the performance of operations in the event of bad weather, as well as a number of other necessary measures. All activities will be carried out in strict compliance with the Environmental Protection Law of the Azerbaijan.